A slight chance of showers before 2am, then a slight chance of showers and thunderstorms between 2am and 4am. Mostly cloudy, with a low around 60. Windy, with a south wind 25 to 30 mph decreasing to 15 to 20 mph after midnight. Winds could gust as high as 35 mph. Chance of precipitation is 20%. Mostly cloudy, with a high near 74. South wind 10 to 15 mph becoming northwest in the afternoon. Winds could gust as high as 20 mph. A slight chance of showers before 8pm, then a slight chance of showers and thunderstorms between 8pm and 2am, then a chance of showers after 2am. Mostly cloudy, with a low around 47. North wind around 15 mph, with gusts as high as 20 mph. Chance of precipitation is 30%. Kindergarten Roundup will be held April 12, 2019 at the Council Grove Elementary School and April 26, 2019 at the Prairie Heights Elementary School. 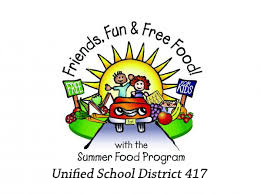 If you have a child who will be 5 years old by August 21, 2019, please call Council Grove Elementary at 620-767-6851 and Prairie Heights School at 785-499-6313 to schedule your child for roundup. If your child is attending our pre-school program, you do not need to call for an appointment. There will be NO regular kindergarten and preschool classes on kindergarten roundup. 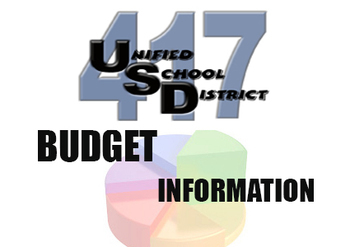 The enrollment in USD 417 is on the rise! 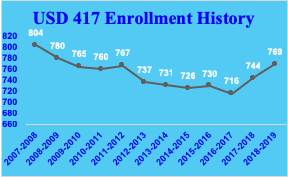 As you can see in the chart below, over the past two years, the enrollment of USD 417 has experienced a steady increase. In fact, the enrollment for this school year is higher than it has been since 2009-2010! 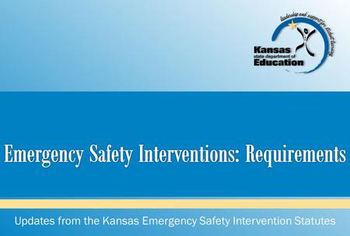 This is fantastic news for USD 417, however, it does present some challenges that have to be addressed. One of the major challenges is class sizes and available staff at the junior high school. To address this challenge, the administrative team explored numerous scheduling options and presented four options to the board of education. Of the four options, the most feasible and advantageous option was to move the junior high to a five period day. I want to stress that the five period day will not operate like the trimester does at the high school. However, the five period day will align the class periods between the junior high and high school. This alignment will be beneficial in many ways, as I will explain later in this letter. In addition, this schedule change is similar to previous middle school schedules, as well as, how English Language Arts is currently being taught in our elementary schools. A few years ago, the district reorganized to be more efficient and better utilize fiscal resources. Part of that reorganization was moving the junior high to the high school building. Moving the junior high to the high school building provides numerous advantages for the district, both financially and in terms of opportunities for students. For example, 8th graders are eligible to take career and technical education electives to explore different career interests. However, only licensed high school teachers can teach those courses, hence the benefit of having junior high and high school students on the same campus. 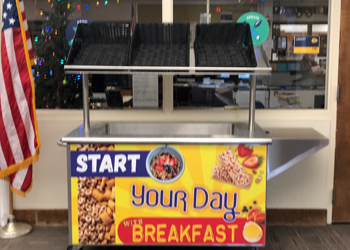 This not only increases the opportunities for our students, but having junior high and high school students in the same building also allows the district to share all teachers between the junior high and high school, allowing maximum efficiency financially as well. The common denominator in making the above a possibility is a common class schedule between the junior high school and the high school. The new schedule for the junior high and high school allows the above benefits to become a reality! I would like to invite you to attend one of three meetings where the administrative team will be presenting information and better explaining the new schedule for the 2019-2020 school year at Council Grove Junior High School. We will be meeting on three separate dates; March 7th, March 19th, and March 25th. All three meetings will start at 7pm and will be held in the commons area at Council Grove Junior/Senior High School. All three meetings will be the same so you only need to plan to attend one date. If you have any questions or are not able to attend one of the three meeting dates but would like additional information, please call me at the district office, 620-767-5192.